When it comes to eating healthy, there's no one-size-fits-all approach. Some people prefer to eat three square meals a day while others eat five or six smaller meals throughout the day. 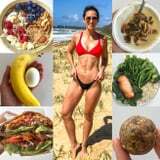 For dietitian Leanne Ward (@the_fitness_dietitian on Instagram), she prefers to eat three moderate meals and two or three snacks a day - and based on how great she looks in a bikini, her food choices are helping her stay lean and healthy. Leanne documented a day of what she normally eats on her Instagram page. On this day, she started with Greek yogurt with cereal, berries, nuts and seeds. For her second meal (more like a snack), she had a hard-boiled egg, banana, and a coffee. For her third meal, she ate a high-fibre wrap with canned tuna, cheese, grated carrot, lettuce, and tomato, and had herbal tea with no sugar. For her fourth meal (more like a second snack), she had more Greek yogurt with homemade granola. Her fifth meal was teriyaki salmon with greens and brown rice, plus herbal tea. For her sixth and final meal (more like dessert), Leanne had homemade peanut butter protein balls.